What is a Kanban Board and Why is it Awesome? When it comes to project management and productivity there are few better tools than the Kanban board. Instead of relying on to-do lists and written schedules, users are provided with a clear visual overview of their workflow. This increased visibility affords teams and solo-professionals alike more insights into ways they can better delegate, speed-up processes, and ultimately, achieve better results. Kanban board apps allow you to create and map your own workflow system. This is especially beneficial for freelancers, solopreneurs, and creative teams. Vertical columns act as stages in a project process. These stages form the basis of a project’s timeline, from the pre-work planning and consultations to the post-work reviews, payments, and sign-offs. Each column name can be fully customized to match you or your team’s unique process. Complex stages and systems are mapped out clearly, allowing a solo business owner or agency team to easily view the status of particular tasks and the project as a whole. The columns house what are known as Kanban cards. These are little notes on which individual tasks are written. Usually just a small sentence or two will be needed in order to understand what that particular task is. After all, the whole point of the Kanban board principle is to easily decipher what needs to be done, and when, with just a quick glance. The cards can be further customized using color codes. These add visual clarity and alert the user to when a certain task is urgent or soon needs to be made a priority. User avatars can also be added to the card signifying the team member who has been assigned the task. The customizable columns, the color-coded cards, and the avatars all make the map of your workflow easy to see and understand. You’re much less likely to miss a sizeable task like you might with a written list or a collection of jumbled post-it-notes. The Kanban board columns can be swiftly modified and moved if the nature of your workflow changes in any meaningful way. Stage one of your project management schedule might require a new type of work and this can be added, for example, to the far-left side of the board (or anywhere else) at any time. The added or reorganized columns can be given a customized name, which can be anything you like. This allows you to create bespoke stages applicable to your unique industry, project type, or work process. Task cards can be quickly moved from one column to another. This is the driving force behind the success of the Kanban board system. It allows you to modify workflows simply by dragging and dropping a task to another stage of the project schedule. Most cards only need a sentence to describe the task it denotes. However, you can also click a ‘View’ button to read more detailed information about that task. This might include details such as what needs to be done, when it needs to be done, and references to check. Perhaps the most beneficial feature of Invoice Ninja’s Kanban cards is the ability to time the task. When you begin work on the task, simply start the timer, and then stop the timer when the task is completed. The time data is automatically saved and can then be immediately transferred to an invoice. The task time can also be manually edited. The Kanban technique was first developed as a tool for teams in the Japanese manufacturing and engineering industry. Workers would create cards of tasks or items that were needed to be carried out or made elsewhere in the system. This technique later developed into the widely popular tool we use today, and which we provide ourselves here at Invoice Ninja as part of our suit of invoicing features. For any company team, the Kanban board provides a whole range of benefits. Teams can map out workflows according to the individual project and the skills each team member brings to the table. The frequent real-time updating of tasks allows all team members to see the exact stage the project is at. The team can then make any modifications or communicate concerns and ideas. For solo-professionals, including freelancers, Kanban boards provide an attractive visual project management tool with which to accurately keep abreast of their various client projects. With color coding, labels, tags, and column customization, the solopreneur can record and analyze multiple client projects at the same time, on just one board. What’s more, the freelancer can also include non-billable tasks which might in some way impact on their client work. These might include arranging meetings, invoicing, bookkeeping, exercising, mealtimes, and even planning rest time. 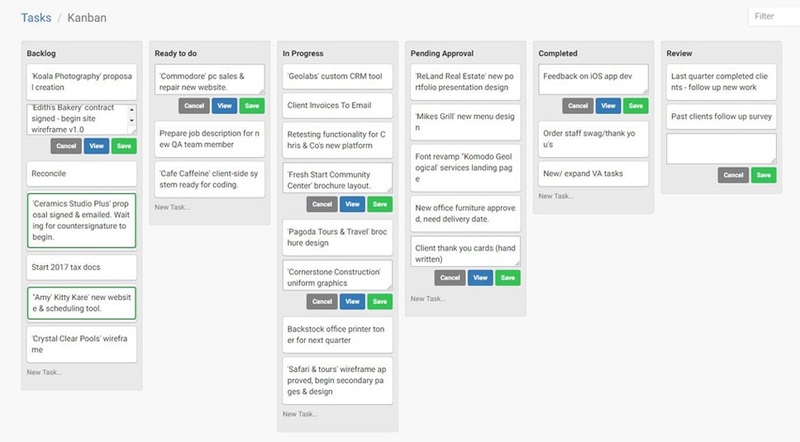 We’ve written previously about how Kanban boards can help freelance professionals better organize their time. At Invoice Ninja we have created our own Kanban boards which can be used to plan, update, and analyze your workflows. The columns and cards can be customized to suit your exact work habits and strategies. The Kanban boards, just like with all our tools and features, can be fully integrated with other apps, allowing you to further streamline your work processes. Best of all, our task time tracking feature allows you to accurately record every second spent on each individual task, thereby allowing you to quickly transfer this time data to the relevant invoice.